Facebook is platform which gives user something new always to stick with it. 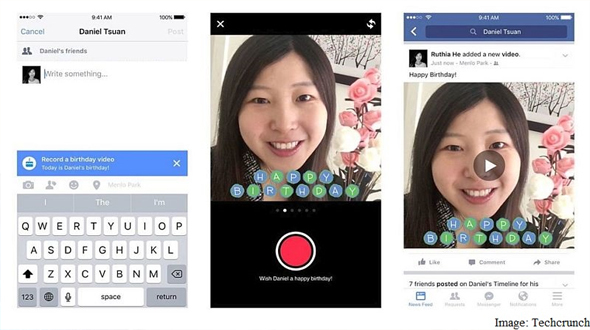 Taking the trend ahead it (Facebook) has rolled out a new feature that make user cable to wish their Facebook friends by recording video on their birthday. Time duration of the video will be for 15-Second. Features seem to make the birthday wish more interesting and event full. It will be replacing the text or image format of birthday wishes, on which maximum user depends as of now. As of now the feature has been rolled out for Facebook’s iOS app only. The feature comes into play as user heads to the friend’s wall to post the wishes; there you find an option to post the video then text. While recording users can also add frames to the video to make it more interesting. If the feature becomes popular, we will see a new way of wishing Happy Birthday on the Facebook. Hope this feature soon be available for the entire user of Facebook to become more popular. Hope you have liked the post. Do share your views and comment in the comment section below.